Something we all loved all the time! 1. Heat up claypot with oil and add ginger to fry till fragrant. 2. Add sliced tofu to fry till sides are brown and firm. 3. Remove tofu and drain out excess oil and leave about 2 tbsp of oil in it. 4. Add mushrooms and lettuce to cook till soft. 5. Add tofu and seasonings back into the pot to cook for 2 mins(over high heat). I used fresh mushrooms this time, thus I had to subs Chicken Stock to make up for the mushroom stock. 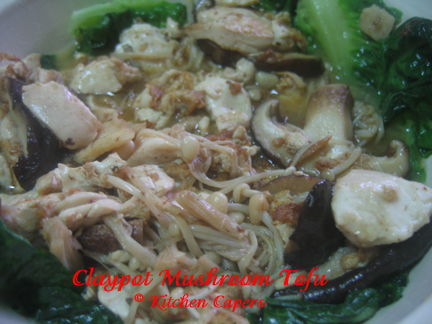 This dish was to use Mushroom stock that is made for soaking dried mushrooms. If you have spare dried mushroom stalks, you can add hot water to make the stock. what is mushroom sauce? if i don't have any - what can i sub it with? want to cook it tonight! Mushroom sauce is like Oyster sauce, except its vegetarian. If not, just subs it with Oyster sauce.